The current year "Overall Summary" report screen is for viewing information vital to the livestock operation. 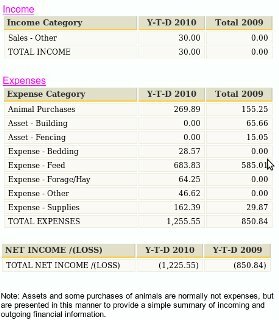 The information displayed is for all animals currently owned and it provides a summary of the current year and totals for all breading activity and other information described below. 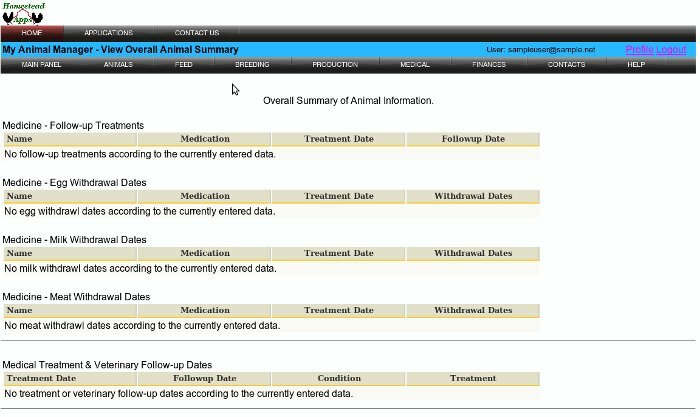 The "Overall Summary" can be accessed from the "Main Control Panel"
The medical reports display any animals that have follow-up dates for medicine that are current, for vet visits, or medical treatments. In addition, the medical area also lists any current animals with medication withdrawal dates that have not expired. The breeding reports provide a concise list of the condition of the breeding animals whether the animals are in gestation, waiting for breeding or nursing the offspring. This report lists each female animal, the total number of births, the total number of offspring that survived, and the survival percentage. The report allows the user to easily identify poorly performing breeding stock. This report lists each female animal currently, within 7 days, due or just past due less than 5 days, the breed date, the due date, and the number of days until birth or past due. This report may be used to alert the user of upcoming births and make the necessary preparations before birth. This report lists each female animal currently past due more than 5 days from the estimated birth date, the breed date, the due date, and the number of days past due. This report may be used to alert the user of failed breeding attempts. To remove a failed breeding attempt from this report click on the animal name and select the failed breeding attempt from the breeding screen and mark the breeding as a failed attempt. This report lists each female animal, that has live births, currently listed that may be available to breed. The report lists all female animals that are not currently impregnated. The animal's name, type, age last breeding date and last date of birth, and last number survived are displayed. Using the displayed information the user can make the decision whether to breed or rebreed this animal. This report lists each female animal, that hatches eggs, currently listed that may be available to breed. The report lists all female animals The animal's name, type, age, and last breeding date are displayed. Using the displayed information the user can make the decision whether to breed or rebreed this animal. The production report displays production totals for the current calendar year-to-date. The feed report displays feed usage for the current calendar year-to-date. The financial report displays income, expense and new profits or losses for for the current calendar year-to-date and the previous calendar year.